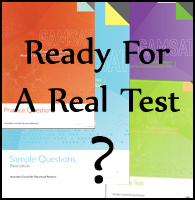 Every GAMSAT guide, e-book and preparation course agrees – if you want to score highly on Section 1 – you need to continually practice GAMSAT-style questions. This site enables you to do exactly that. Helping students prepare for Section 1 since 2012 – this website contains 100’s of free GAMSAT-style questions . Answers and explanations are posted in the comments. Use the navigation bar above to find what you are looking for. If you’re also looking for help with GAMSAT Section 2, then GAMSAT Sample Essays is the sister site of this one. There you can look at sample essays sent in by students along with tutorials and advice for improving your score on GAMSAT Section II.